Recently, one of the highlights of NBA 2K17 is its improved MyPark mode, which adds 2K's newest mode Park After Dark. After the event started on Nov. 26, there are many comments about that. The mode, which is part of NBA 2K17's MyPark, was supposed to add a club-like element with bright neon lights and the latest music in the MyPark playground. 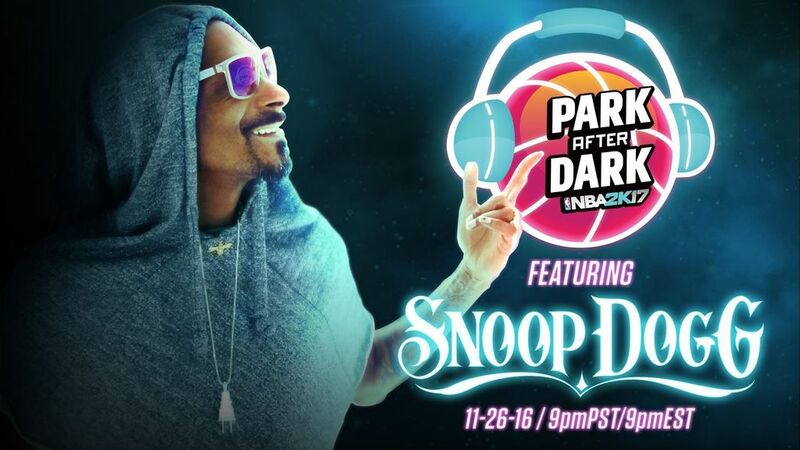 2K even got Snoop Dogg to guest DJ the first edition of Park After Dark. The debut of Park After Dark, according to the Twitter accounts of 2K’s Chris Manning and Ronnie Singh, was a success with many fans proclaiming it fun and new. Going into the first edition of Park After Dark, many of the issues that faced MyPark on a daily basis, such as players not being allowed to come into games or randomly being kicked out, were not fixed. It was only a matter of time before those issues reared its ugly head. And during Park After Dark, it did. Once things got working, park after dark can be a great event. The dunk contest controls are intuitive, although the scoring system still is hard for gamers to determine what makes a "great" dunk. Snoop Dogg did have a sweet mixlist and it made the atmosphere of the entire event enjoyable. Some gamers think it was probably because of the smaller playerbase on PC. They are able to have a more pleasant expierence than the other consoles, but either way it is a improvement. NBA 2K17's Park After Dark was met with tepid reviews as technical issues ruined the mode for many. There were complaints about Park After Dark where players were waiting to get into games, but never made it into any games during the “party.” There were also complaints from players such as players being randomly kicked out or not being allowed to join a one-on-one, two-on-two or three-on-three pickup games. Sadly, these issues continued to haunt gamers as the 2K servers seemingly crashed for a considerable period of time. Perhaps, it was a case of many gamers trying to log on simultaneously, but 2K could do very little to accommodate the volume of players. The After Dark mode was supposed to integrate a virtual party mode into My Park courtesy a concert from rapper Snoop Dogg. However, most gamers never witnessed the concert despite numerous attempts to get into games. Also, several gamers complained about having to pay large amounts of Virtual Currency (VC) to purchase After Dark accessories and clothing that could not be equipped immediately. While they did eventually receive the purchased items, most gamers could not take their MyPlayers to the virtual courts. While many believe that night one was a complete and total disaster, it gave the team at 2K an idea of how many people would most likely be in MyPark during those special nights so that they can adjust accordingly. It will be interesting to see how the second night goes and whether many of the issues that fans reported will be fixed in another patch. Have you met this new mode? What were your impressions of the new mode? Whatever, if NBA 2K17 have more park events like this and a new patch to fix the prevailing issues in the future that would be great.